This postcard of Stockton High Street shows a very interesting range of architectural styles, the bay windows and dormers of the Jacobean period, the three storey, red roofed Georgian, the stone and red brick Victorian and the modern 1920s Art Deco. The decline of Stockton High Street might have occurred anyway but demolishing that portion of the High Street almost certainly accelerated it. There may be some bustle in the enclosed Castlegate centre but what about the rest of the High Street? I took a walk there a couple of years ago – charity shops, pawnbrokers and bingo parlours were evident but not the quality shops of years ago. Lets face it Stockton High Street of old can not be revived. It’s gone. Enjoy your retirement Frank and your 90th birthday if I do miss your postings there are enough old ones on this site alone to keep all the Frank Mee aficionados satisfied for some time to come thank you. Having read all the comments I smile to myself thinking most of you were not there,. what was lost was in 1940-50 less than one hundred years old, the Empire and some of the other buildings went up in the late 1880’s to 1900’s. That Money pit called the Globe which I remember going to after it reopened in the late 1930’s I believe for the second time, my generation would have flattened and built something modern. The Castlegate Centre to us my Mother in particular was a lovely bright and warm inside shopping area where she could get most of the things she needed. I was married in the 1950’s and we were offered furniture some of it Victorian some even older, my wife said no thanks I want new so we got “G” plan, it would never have lasted as long as the furniture we were offered but it was bright and new all that mattered. People who declare the loss of the old Town Shopping area’s should visit Yarm as I have done over the last few months, a busy thriving street of shops from supermarkets to a funeral parlour pubs and cafe’s, little shops where you can buy just about everything and plenty of feet on pavements, Why? The answer is they have left the car parking in front of the shops, it would seem as is shown by the out of town shopping sites people do not want to walk far from their cars. As more people move on line to shop and even I have done that, more than once. so our High Streets will become what they once were Residential and Office blocks with a few small local shops. I may never see that but my Grandchildren will. Keep commenting Frank I relish in your contributions. Steve, I do stress that what I put on paper are only my opinions as seen through the eye of an engineer both in the army and civvy street. There have been complaints I write reports, that is how the Military like it, thus are trends set. Our parents went through one war, then in 1929 the great crash that put millions out of work with no dole or help apart from the Church and neighbours who had a little more than them. Things were beginning to pick up in 1938 then the war came, six long years and even worse when the war ended and America withdrew all aid until the Marshall plan in 1947-8 where Europe got most of the aid, the war wreckage had to be repaired. The people only began to start feeling some benefit when rationing ended some things as late as 1952 that by my count is 22 years and we wanted something different and new, we newly weds got our “G”plan furniture, Mother cleared her house as many did of things older than they were, they now appear in Antique shows worth £1,000’s. I am trying to explain our mind set here. Our old worn down town needed money spent on it there was none, those of us who had the pleasure of working by the river saw what was behind those decaying facades and yes we knocked rats off the crane tracks with catapults and rivets, usually for a bet, our sandwiches were in tin boxes. When small amounts of money did become available to councils they had to spend in a functional way there was nothing for buildings well past their sell by date. That is why I am against the Globe refurbishment, it has doubled the original estimate and they are still finding loose walls and rusted girders, that money could have been put to better use in the town. After saying that I have travelled a lot but Norton where I lived and Stockton where I schooled and worked were the places I dreamed of as I looked at the myriad of bright stars on guard duty in the Desert. Wandering now over, I still live in Stockton and always will. We cannot complain about the town changing when we all shop out of town and on line, that will not keep the old shops open. Who has the answer, I hope the Council do, I think they are going in the right direction, my opinion only. PS those who are sick of me pontificating I plan to retire in a months time when my 90 comes up. Over many years I have enjoyed reading your replies from your opinions, experiences and wealth of knowledge. As you say sometimes your opinions. Please don’t let others who may disagree with you dishearten or stop you from continuing from inputting to this site. I love reminiscing of Stockton, but we do have to change and move on, or would we all like to go back to living in caves. We all have happy memories but we do have to move on and yes sometimes mistakes happen. Look forward ( hopefully ) to your continued comments. Frank you must never retire we enjoy your input and experiences, indeed we need MORE people like you to help us retain the details of how we used to live. Permission to retire denied soldier 🙂 Steve. Steve, I do hope you were at a correct position of attention submitting that order otherwise you could find yourself in the cookhouse tin room making greasy pots shine until you could shave in them. Frank (Phil, as I know you) I hope that was a threat and not a promise! You are one of the main foundations and fonts of knowledge on this website, losing you will be like losing an encyclopaedia or the internet. Anyway, for you 90 is the new 60…..keep going. David, I am Long past threats, have not fired a shot in anger since Suez. I thought we keep covering the same ground and people too young to be there at the time have no idea of our mind set in the times we discuss on here. You cannot compare modern times to those long years of Austerity my parents and i went through. Yes we have food banks today well my mother was the food bank then, a few vegetables from our garden and a small piece cut from the side of bacon in a paper carrier bag, slip that behind Mrs So and So’s front door do not let her see you, they had nothing but pride. Mum’s little parcels were a life saver to women with Husbands in the forces or prison as two of them had. Anyone who went to London after the war would realise the massive rebuilding the Government had to do all over the UK and they were having to borrow massive amounts of money putting the Country further into the red, a debt that was not cleared until Mrs Thatcher came on the scene. Places like Stockton had to spend any money they got on rehousing the many people who wanted new housing inside toilets and bathrooms, the single cold water tap and old tin bath were not good enough. Much as we may have wanted to keep things the same it was not possible. I have been told History is rubbish on more than one occasion, you get to my age and know it is relevant only we never seem to learn from it, I had decided to pull back, people make their own minds up, if they regret a past they did not know it is their choice to make. I will be around to comment on what I know and lived although another £2,500,000 needed for the Globe makes me think we have not learned the lesson. Phil, or Frank as with all things in life “yer takes yer choice”. Frank if we do not remember, learn and pass on the lessons of history, then we will be forced to relearn the same mistakes time after time. HISTORY is VITAL to any society’s development. People like yourself and easily accessible historical archives are ESSENTIAL to our today and tomorrow. As you say because we have not learned about issues like the Globe Fiasco we have to keep relearning and repaying time after time. Anyway youth is wasted on the young. Many shops in Yarm are closing too though; the bra shop recently, Jules B, the butchers, are examples just off the top of my head and the reason they’re all giving is the dramatic increase in business rates, the parking and changing consumer habits. Today we want one-stop shopping for our groceries and the rest online. Looking at the way things are moving forward the buildings in the High Street, Stockton-on-Tees, will possibly all be knocked down and the High Street become one vast car park! Stockton-on-Tees presumably has a town council. Somewhere buried in the minutes of the council meetings, the meetings and minutes of which are required of the council by law, the council must have discussed what was happening to the High Street. The various council committees must have discussed options and proposals, planning applications approved and rejected and other topics. The various committees views on these matters would make interesting reading. I absolutely love these images of the past. As Bruce has said, look at the selection of architectural styles, the vehicles and the social indicators, 4 women at the bus stop all wearing hats. I share all the sadness of other commentators and feel totally frustrated that there is no way of reclaiming the lost charm of this part of Stockton or taking retribution on those who did the damage… and damage it is! And by the way Graham, you are right the No 4 did go to Fairfield terminating at a pub called The Rimswell. Now called the Stockton Lodge, Roy. Sorry, but the Castlegate was only a failure in recent times. When I was growing up in the 70s and 80s it was always busy along with the rest of the high street. Teesside Park crippled the high street and online shopping is in the process of finishing it off. If the improvement schemes you mention had never been done, or some other schemes had been tried, the high street would be just as knackered today. “Nostalgia” if the Greek I partly learned at School is correct, (one year then dropped and we only had Latin and French) it means Homecoming or the ache for home when away. The problem is we go away and come back expecting it all to be the same it never is. Sandra asks what would our Grandparents and Great Grandparents think? I can answer that, Born in the Robson 1929 and 90 next month I am a Granddad and Great Granddad and think Stockton now is a vast improvement on what we had. Every picture tells a tale or a lie which ever way and from what aspect you look at it and those pictures do not show the years of neglect, lack of maintenance, ravages of war we saw. The frontages hid a multitude of sins, the money before and long after the war was scarce, what money was available had to be used for the best result not a chocolate box picture, it was functional. The Council at the time did what they could with what they had plus a library of Government do’s and don’ts they had no lee way, there were so many things needed doing including the clean up of the River and its banks, if you had to work down there as I did you were left in no doubt as to what went into the river when the tide went out and the detritus was left on the backs for hours in the sun. Add to that the vast number of new houses that were built out of town as people clamoured for inside toilets and bathrooms plus a bit of green garden, you start to understand the problems the Council had. I travelled though my own motto was never go back, it is never as you remember things, the same applies to our home towns they change continually, not all agree for the better. Change is the natural progression of life, my Grandchildren think Stockton a good place as I did at their age. I tell them what it was like living then, to them History, will they ask why the red brick indoor market had to go in a few years time? I wonder. Frank. I have been to Bruges a few times and am amazed at the Architecture there. They were bombed during the War and the structures were completely gone but with good planning it was brought back to life. Comparing as you put it the slums behind the High Street were as near as what Bruges suffered and with good handling keeping the facades and doing work that was necessary behind would have been much better and pleased almost all the people in Stockton. I agree with you Bob and I wonder why facades at least could not have been preserved. Well like Frank I lived through these times and yet I still think the High Street could have maintained its character. He mentions the Globe would have been flattened yet I look at all the interest shown in its restoration and to my mind that would have been another huge mistake, I do not think that to look back at what was a High Street full of character is nostalgia but just a recognition of what was a quite unique High Street and I believe the reason Yarm is so popular is not because of the parking but because they retained the character of the town, nostalgia is not a bad thing after all. Remembering old time dances and old music is fine if that’s what you think as long as you recognise that other people have differing views and should be allowed to voice them without being told they may be mistaken, I too live in these modern times and embrace them but that’s not to say everything new is good that’s not nostalgia its just knowing what I like. Bob, Got to agree my Wife loved Bruges we often had a couple of days there on our way to Germany. It took a long time to rebuild and the Marshall plan plus money from the Colony’s in Africa helped them do that. In the Ruhr where whole towns were flattened a couple were moved miles away and rebuilt in the old style, it was long after the war and part of the rush by America to bring that part of Germany back into production. One war ended and another war the cold war started. Germany was to be the buffer between East and West, those of us up close to that border knew how close we came. October 1962 comes to mind when we all went on red alert. Stockton never had the money those places got, the Government gold reserves were gone, our Empire crumbled and we were in hock to America over our heads. Stockton did what it had to do with what little it had. Plain and simple was the way frills and foibles out because London Liverpool, Southhampton and Coventry plus many other places had to be rebuilt first and they got the money, we lost out. The thing that strikes me is the many beautiful houses Churches Chapels and even Dance Halls that just vanished and not a word said, the Corporation hall of many memories flattened not long ago and now a car park, Stockton did not lose only a few dilapidated buildings in the High Street it also lost its Historical Engineering Icons. On the Empire site a hotel was built, The Swallow and even in this short passage of time it has now closed, possibly even demolished, what a waste of space. John Poulson, and his organisation were responsible for the demolition and rebuilding of the Castlegate area circa 1969. The word ‘criminal’ is very apt. A search of the internet will explain why. Just read some comments. The awful looking concrete Castlegate Centre was built here. Disgraceful! Nothing about it is in keeping with the history. I agree with all your comments they pulled the wrong side of the high street down. It was a pleasure to go to the high street especially Wednesday and Saturday for market day. Not now the place his dead. 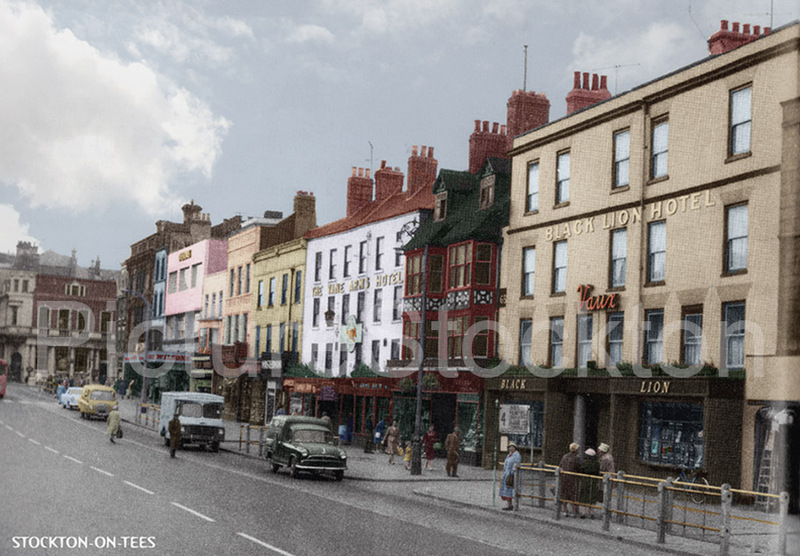 Stockton High Street as I knew it in the 1950’s and 60’s, when Saturdays were bustling, has long gone. Most of the big retailers were there. I had a part time job on my Uncle Jim Carrols stall on Saturdays, 1963/64. Sometimes the High Street was so busy, and the market packed, it was difficult to walk anywhere. What is going happen with the large empty stores, when they have all ceased trading, including Debenhams? There can only be so many cafe’s, and charity shops, and these large premises don’t suit small businesses. Perhaps the Globe theater, when its restoration is complete, will start some kind of resurrection of the High Street. I don’t know what was built on this spot after demolition, hopefully something fitting to the history. I don’t understand why a lot of these wonderful structures can’t be restored, or at the very least have to rebuild in the same way on the outside. I’ve seen many areas where they build a modern structure smack in the middle of old buildings, looks ridiculous, hopefully not the case here! The Castle Centre (now Castlegate Centre) was built there, a modern (for the 70’s anyway) structure. No4 bus stop – went to Fairfield I think. Yours, mine and hundreds of people still to this day find it just so very sad to believe what they did to our beautiful town. Everything just ripped out out of it, what would our grand parents and great grand parents think of it. I can’t even bring myself when visiting family in Norton to venture into “town”, it breaks my heart. Hi Sandra, You would be hard pushed to find much familiar with Norton these days, the green bits have all been built upon now, The village is now just a suburb of the town. Modernity does not always mean improvement. Hi Steve, yes I agree with your every word, I “came home”, to visit my family, some of who still live in Norton and saw a massive change. It seems to be following in the footprints of Yarm now, so many new bars and restaurants, lots of our “old locals” changing beyond belief. I realise we have to move with the times now and a totally different lifestyle for the young compared to ours,ie dartboards, cards, dominoes and the old juke box. A bag of chips, possibly a Pattie if you had any money left. Life goes on is the saying, our parents would have said the same thing as me when they were getting older. Norton still retains the most beautiful High Street and period houses, plus a duck pond to be proud of and many happy memories. Let’s hope that our grandchildren in time will also love that beautiful village. Yes that era will do me, its the period the High Street still had character, with the glorious Empire behind you as looked in that direction. What a travesty and the decline of Stockton town centre.